The AMERICAS HEAT boiler is designed to be installed into your home or garage as sole heat provider or work in conjunction with any existing heating system. Our boiler is also able to heat domestic hot water with the addition of a domestic hot water coil. 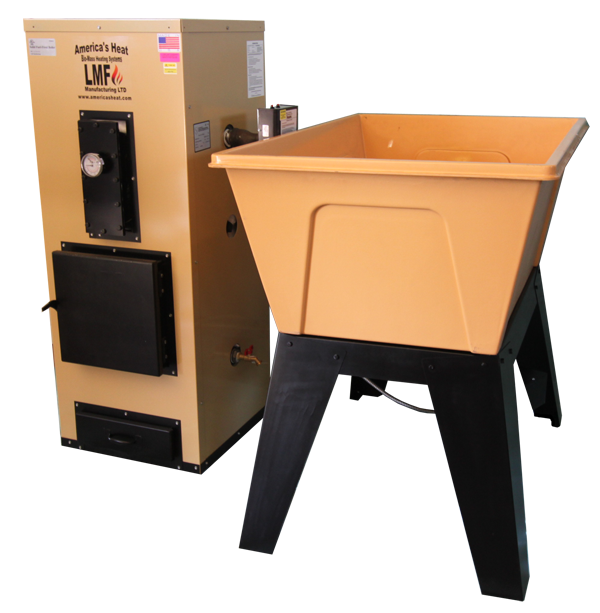 The AMERICAS HEAT boiler uses wood pellets, grains, or bio-mass products as fuel. These fuel sources are quickly and easily renewable and inexpensive. Conventional sources of heating fuels such as propane, natural gas, fuel oil, and electricity use an excess of our unreplaceable fossil fuels. Burning wood pellets and bio-mass is more environmentally friendly and helps to reduce our carbon footprint. The America's Heat Boiler model AHB-170P is Certified by the EPA for 2015 New Source Performance Standard for Residential Hydronic Heaters at 40 CFR Part 60 by the United States Environmental Protection Agency. The AHB-170P model is also UL Listed for your safety. We construct a fire box out of boiler rated plate steel, and our fire pot out of cast iron, then we place it below the water jacket of our boiler. The heat is then distributed through the heat exchanging tubes that run through the water jacket. By placing the boiler vessel directly over the heat source allows the heat exchangers to efficiently scrub off the maximum amounts of heat being produced. The heated water is then circulated to the structure being heated by external pumps (not included). The heat can be dissipated throughout the structure by using water-to-water, water-to-air heat exchangers or direct circulation to convey the heat into the home or buildings forced air furnace, hot water heater, and or radiant floor heating system. America's Heat boilers utilize easily renewable, readily available, cleaner burning fuels that are much safer and cleaner for your home and the environment. The model AHB 170P is a fully automatic biomass boiler rated up to 170,000 BTU's input. The furnace operates no differently than any fuel oil, LP or natural gas furnace, other than the fact that it burns a solid fuel. When there is a call for heat, the augers feed fuel to the burn pot. When the thermostat is satisfied, the system will automatically slow the auger motors and combustion blower to the minimum firing rate to maintain the fire in the burn pot. All America's Heat units have a large storage bin that holds up to a 10 day supply of fuel, which is automatically fed into the combustion chamber as needed. There's no need to load the furnace several times a day like a cord wood stove or furnace. Our multi-fuel options such as wood pellets, corn, wheat, oats, barley, and cherry pits, also eliminates the bark mess, coal dust/dirt, insects, splinters, and the storage and handling problems connected with the use of cord wood. Burning Bio-Mass fuels such as corn eliminates creosote and the problems associated with it. The furnace will remain lit as long as the bin contains fuel, and will shut down automatically if the fuel supply is depleted. Our boilers will come complete with Aquastat and Timer controls, 14 bushel/800 lbs capacity hopper with stand and lid, low water shutoff, 6" barometric damper, fire poker, augers, auger motors, Watts high temp pop-off valve, boiler drain, metal wire brush for cleaning, air kit, combustion blower, tridicator, and customer support (buyer responsible for thermostat and thermostat wire) . Domestic Hot Water coils are available for an additional $375.00 (installed at factory when purchased) Buyer is responsible for proper venting, venting equipment and installation. All America's Heat Boilers require a dump zone. Buyer is responsible for all installations. LMF Manufacturing LTD/America's Heat suggests that installations be installed in accordance to local codes and performed by professionals. An America's Heat boiler can be equipped with a digital Pellet/Corn-Trol system. A Corn-Trol can maintain a fire for several days in low-fire mode. The digital Corn-Trol system also makes our furnaces true variable speed units. The Corn-Trol computer controls the speed of the augers feed rates from 7,000 to 170,000 BTU's input. Please contact us for more information regarding a Corn-Trol operating system. The America's Heat AHB-170P furnace is a variable feed system that can be adjusted for 10,000 BTU minimum or 170,000 BTU Max. Each furnace is made as a stand-alone unit or as an add-on to your current system. The America's Heat furnace features quality construction for long-lasting performance. Our warranty consists of 20 years limited warranty on the boiler vessel, 2 years repair or replacement for a Corn-Trol (if equipped with one), 1 year coverage on electric gear motors. With its quality construction and most up-to-date safety features, the America's Heat furnace is one of the safest and most efficient biomass boilers on the market today. America's Heat products are all MADE IN THE USA. We will ship to Alaska and Canada, please contact us for a shipping quote to Alaska or Canada. Buyer is responsible for additional costs for lift gate delivery if required. Furnace, Hopper, Hopper Stand, and all other included parts will be shipped on a 40" x 48" pallet. Complete pallet and contents will weigh approximately 850 pounds. Additional Questions? Please contact us.